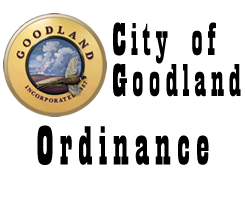 AN ORDINANCE PERTAINING TO UTILITY VEHICLES IN THE CITY OF GOODLAND, AMENDING SECTION 16-518(c) OF THE CODE OF THE CITY OF GOODLAND. (c) Proof of insurance, as required in section 16-504, shall be furnished at the time of application the annual registration fee for a utility terrain vehicle shall be $25.00 and due by the third Tuesday of January of each calendar year. The full amount of the license fee shall be required regardless of the time of year that the application is made. The license issued hereunder is not transferrable. SECTION 2. This ordinance shall be in force and take effect after its publication in the Goodland Star News. PASSED AND ADOPTED this 5th day of June, 2017, by the Governing Body of the City of Goodland, Kansas.